These new revelations are bound to impact the current debate about the border crisis and immigration policy. To the Veterans of the Armed Forces of the United States, I salute you! Just a short two years after President Obama stepped into Egypt’s political theater supporting the ousting of Hosni Mubarak, his choice for President of Egypt is now being asked to leave. Exactly a year ago the President called the Muslim Brotherhood’s candidate, Muhammed Morsi, to congratulate him on his win in the election replacing former President Mubarak. Mubarak was no friend to the Muslim Brotherhood, same as his predecessors dating back to Nassar who actually had Brotherhood members arrested, executed, or run out of Egypt after their failed attempt to assassinate him. Anwar Sadat was not so lucky, being killed by Brotherhood members within his own army in 1981. Yesterday, June 30, estimated “millions” of Egyptians flooded the streets of Cairo and other cities to tell Morsi to “Get Out”. This follows a year of increasing Islamist governmental oppression foisting Sharia Law upon the citizens of Egypt and failure to improve economic conditions, and persecution of those who speak out against Islamism including the Coptic Christians, secularists, and “moderate” Muslims alike. At the time of this writing there were 7 dead, 253 injured in Sunday’s rallies, and protesters had set the MB Headquarters afire, while President Obama has steadily increased Brotherhood access to American Government agencies since his own election in 2008.
likes of Islamist MB groups in Libya, Tunisia, Egypt, Algeria, Yemen, Bahrain, etc. Egypt is perhaps the most strategic nation due to proximity to Israel and the Suez Canal, and has, since Anwar Sadat, been an ally to the US. 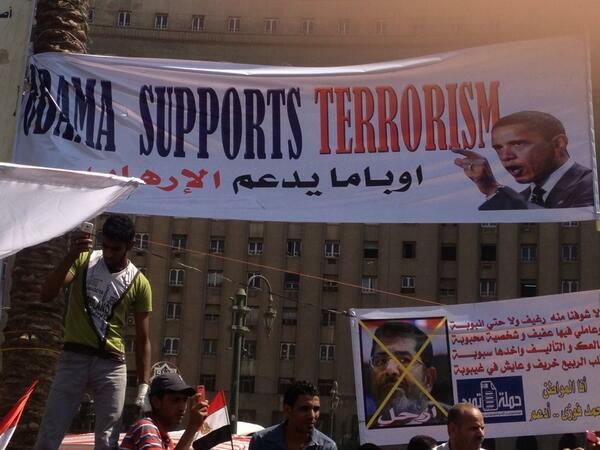 The people of Egypt may be rethinking that association now in light of the fact that Barack Obama has become the first American President in history to support an Islamist government regime for Egypt. The now laughable “Red Line” threat to Syria and ensuing policy there has led to further erosion of American standing in the Middle East. Now the US Government (including Dem/Rep Congress) is on record as supporting and arming Islamist radicals who butcher their foes like pigs and eat their organs raw, and beheading others including a Catholic Priest. Not sure how we got to the point that the Russian President Vladimer Putin is questioning the American choice to support such barbarism, giving our arch-rival the high moral ground on the global stage. I do not advocate supporting Assad but since we waited so long to see where the Muslim Brotherhood was going to be on Syria, can’t we just stay the hell out of one of these? Israel can take care of itself, and would probably feel much more secure with out this Administration constantly creating “situations” for them. We already have a thousand Marines in Northern Jordan as “advisers” and Obama just recently deployed 400 US Army troops to Egypt, trained in “riot control”. The US has an additional 400 troops in Turkey manning Patriot missile batteries along the Syrian border. Iraq has devolved into Shia vs. Sunni sectarian violence since US withdrawal, leaving its government questionable. We will be completely withdrawn from Afghanistan by the end of next year, currently holding “talks” with Taliban leaders there. Are we that naive to believe the Taliban will simply put their AK’s down and leave the villagers to go back to growing poppies? (Sometimes I think the reason we invaded Afghanistan was to get the product from those poppies and distribute it to Washington. They sure act like they’re stoned out of their gourds up there!) Saudi Arabia now has free access to any airport in the US; Unlimited flights with DHS deferring to the Saudi government to screen those travelers to the US. Today, since the “Arab Spring” began, the Muslim Brotherhood has gained control of much of North Africa, bringing their chartered goal of the “Khalifa” (Islamic Caliphate) much closer to fruition. MB continues its efforts in Turkey, Lebanon, Jordan, and Syria, working toward the caliphate. Turkey’s Islamist AKP (Justice and Development Party) Government wants the Caliphate, which until 1922 had been held by the Ottoman Empire (Turkey) for 500 years. The Saudi’s want the Caliphate, which according to Sharia Law is the common directive to every Muslim. The Saudi King, after all, is charged with advancing the Islamic religion to the world. He is the keeper of the faith and protector of the Kaaba, in Mecca, the most holy site in Islam. The Saudi Flag bears the “Shahada” declaration of faith, “There is but one god Allah, and Muhammad is his Prophet” along with the sword of Islam. For all practical purposes, it would appear that the US President also wants the caliphate. Vladimer Putin, however, does not want the caliphate. He understands that a unified Islamic Caliphate will command the petroleum reserves of the entire Middle East, not to mention strategic and commerce lanes. He also understands that Syria is the keystone in forming that confederacy. And don’t forget Iran! Will the Syrian civil war ultimately lead to Russia becoming militarily engaged bringing Iran and Turkey against Israel, at the end of the day? This chessboard is looking more like Ezekiel 38 every day. Is this American President helping to bring it? His policies are setting the Middle East on fire.